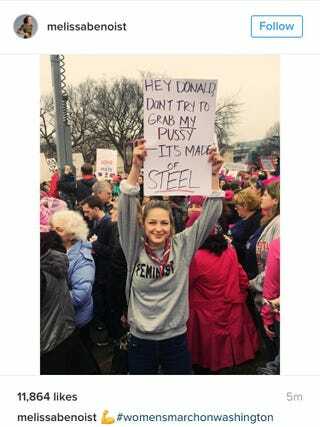 Here is Melissa Benoist, star of Supergirl, at the Women’s March on Washington yesterday. As if she couldn’t get more awesome than the time she was surrounded by puppies. And, whoa, here’s Carlos Valdez (Cisco Ramon), Arthur Darvill (Rip Hunter), Danielle Panabaker (Caitlin Snow), Caity Lotz (Sara Lance), and Keiynan Londsale (Wally West) at the Women’s March. Here is Chloe Bennet and Natalia Cordova-Buckley (Daisy Johnson and Elena “Yo-Yo” Rodriguez from Agents of SHIELD) at the Women’s March, too. Oh look, here’s Ming-Na Wen (Melinda May) at the Women’s March LA. And here’s Maurissa Tancharoen and Jed Whedon (and their daughter), executive producers of Agents of SHIELD, at the Women’s March LA, too. And here’s Krysten Ritter (Jessica Jones) and Rachael Taylor (Trish Walker) at the Women’s March, too. And here’s Scarlett Johansson actually speaking at the Women’s March. And here’s Amy Acker (Fred/Illyria from Angel and Root from Person of Interest) and her husband James Carpinello (Mario Falcone from Gotham) at the Woman’s March LA. So I guess we actually did get a superhuge Marvel/DC/Person of Interest crossover yesterday. It looks like it was awesome. What other celebrities did you find? EDIT: And here are some more from the Women’s March London. Here is Sir Ian McKellan holding a Picard facepalm sign. I mean, it’s everything you ever wanted, right? Gillian Anderson looking cool in her specs at the Women’s March London. And here’s the Twelfth Doctor himself, Peter Capaldi.